It’s January and everyone’s talking about their dry skin. My clients are soaking up extra massage oil. They report using plenty of lotion, but sometimes, their skin still needs help. A professional massage goes a long way, but did you know that Ayurveda has just the cure? You can zap dry skin with a daily self-massage. Winter is vata time; it’s dry and cold. To balance these things, we should apply warm oil to our bodies every day. The oil has a calming and nourishing effect on the body and mind. Daily oil-massage (abhyanga) helps lubricate the joints, increases circulation, and improves sleep quality. It keeps skin moisturized and smooth, without a bunch of gross chemicals. The weather in Iwakuni is colder and dryer than I’m used to, but I’ve noticed a difference since beginning a daily regimen of abhyanga. The process is simple: Warm some oil and apply to your body before getting in the shower. Choose oil based on your dosha(s) or the season. 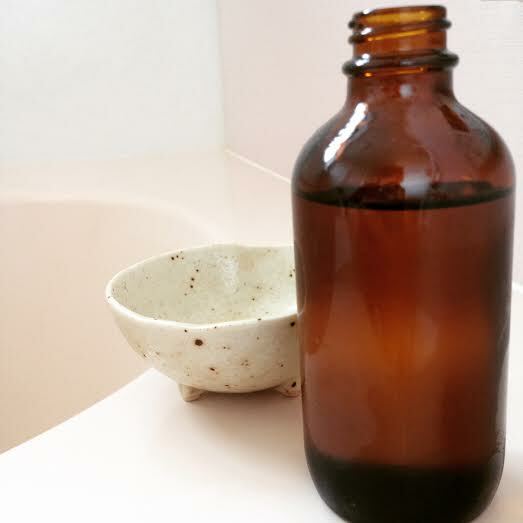 I keep almond oil in a small glass bottle and warm the bottle in a bowl of hot water for 10 minutes. 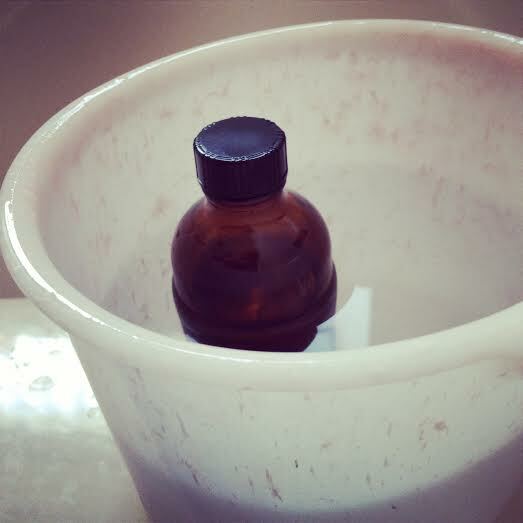 Pour the oil into your hand and start with your scalp, face, and neck (don’t forget your ears). Work around your body using long strokes on your long bones and circular strokes on your joints. I like to do this in a steamy shower room, taking care not to get water on myself. Let the oil soak in for 5-10 minutes. You can shave or do some gentle yoga postures while you’re marinating. Then just shower off the excess oil. If you’re short on time, it’s better to apply the oil quickly and shower off than not to apply oil at all. It’s fine to use soap on your pits and bits, but unless you’ve been crawling through mud and yuck, it’s not usually necessary to soap your entire body. Most soaps are drying to the skin. Apply shampoo to dry hair before adding water. This makes it easier to get the oil out of your hair. After your shower, wipe off extra water with your hands and pat yourself dry with a towel. Another benefit of abhyanga is that the oil acts as a barrier to the chlorine in your shower water. Without the oil, chlorine soaks into your skin and dries it out even further. Try it every day for a week and see how you feel! This entry was posted in Ayurveda, Home & Health and tagged abhyanga, Ayurveda, oil massage, self massage. This has been one of the best, most calming things I’ve discovered I can do for myself.